New York (TADIAS) — Difret, an Ethiopian film directed by Zeresenay Berhane Mehari, won the World Cinema Dramatic Audience Award at the 2014 Sundance Film Festival Saturday evening. The ninety-nine minute drama is based on the true story of Aberash Bekele (Hirut), a 14-year-old from a small, rural village — not far from Addis Ababa — whose widely publicized arrest for murder in the late 1990s ensued an epic court battle that resulted in her acquittal on the grounds of self-defense. The case and ordeal of Hirut (played by teen actress Tizita Hagere) legally ended the long-upheld cultural tradition of marriage by abduction in Ethiopia. 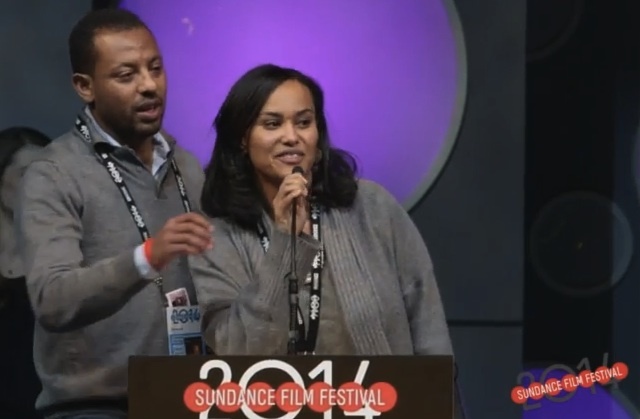 Difret is the first Ethiopian film to be featured at the Sundance Film Festival. The film’s producers include Mehret Mandefro, Leelai Demoz, Zeresenay Berhane Mehari as well as Executive Producers Angelina Jolie, Julie Mehretu, Jessica Rankin, Francesca Zampi and Lacey Schwartz. Other credits include Cinematographer: Monika Lenczewska; Editor: Agnieszka Glinska; Production Designer: Dawit Shawel; Composers: David Schommer and David Eggar. Below are images from the film. Learn more at http://filmguide.sundance.org/ and Difret.com.